James Louis Gillis served as California State Librarian from 1899 until his untimely death in 1917. A far-sighted administrator, Gillis expanded the State Library’s services and made its resources available to all residents. Among his notable accomplishments was the establishment of the California History Room, the California Research Bureau, a traveling library program, and library services for the blind. Gillis also professionalized the State Library’s staff, instituting California’s first civil service rules and recruiting experienced librarians to fill the library’s positions. 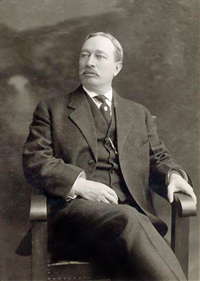 As the California Library Association’s president for nearly a decade (1906-1916), Gillis endeavored to advance the state’s libraries as well. To this end, he hired library organizers to assist small towns in developing their public libraries and established a professional training program within the State Library. Gillis’s crowning achievement was the establishment of California’s county library system in 1909. James L. Gillis was a key force in the modernization of California’s libraries. Peter Thomas Conmy, “James Louis Gillis, Westerner and Librarian: A Professional Biography,” Wilson Library Bulletin 34 (December 1959): 272-83. Hannah Josephine Kunkle, A Historical Study of the Extension Activities of the California State Library with Particular Emphasis on its Role in Rural Library Development, 1850-1966 (PhD diss., Florida State University, 1969). Debra Gold Hansen, “Depoliticizing the California State Library: The Political and Professional Transformation of James Gillis, 1899-17,” Information & Culture: A Journal of History 48 (in press).